Go From Zero To Funny...Fast! Breaking Comedy's D.N.A. is a power-packed comedy writing system designed to get the beginner or experienced humor writer or comedian, writing tight, laugh-out-loud jokes, virtually on-demand! 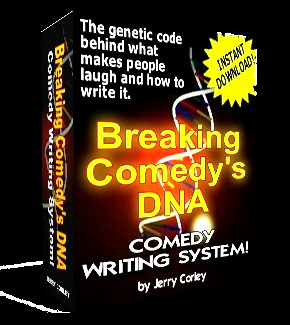 Learn how to write great jokes and comedy material with Jerry Corley's new Breakthrough Comedy System: "Breaking Comedy's D.N.A." With time-tested formulas and step-by-step processes, this unique system will give you a method for actually sitting down and generating jokes and comedy bits from scratch... even if you don't have a subject in mind! It can literally take you from Zero to Funny Fast! Written by 25-year professional comedian and writer for The Tonight Show with Jay Leno, Jerry Corley. This system is instantly downloadable and will have you writing jokes today. So what are you waiting for? Take the next step and start writing comedy today!